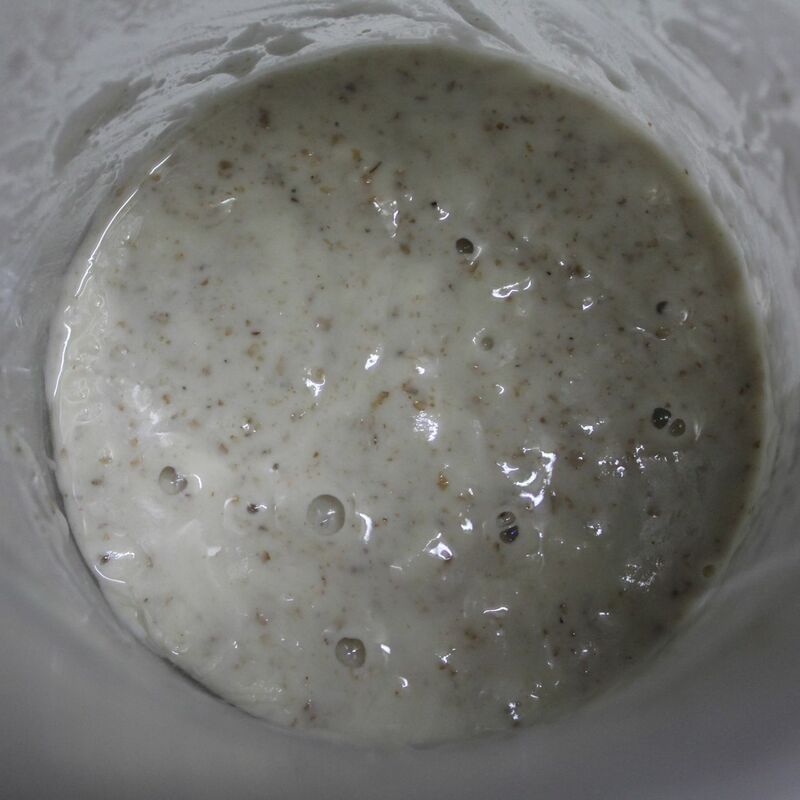 For a long time I have promised myself that one day I would make a sourdough starter. A few weeks ago I finally did it. Let me tell you I was nervous. So much could go wrong. It didn't. After eight days I had a loaf of sourdough bread. I am still no expert. However, I want to reflect on the experience for me - and you if you are interested. 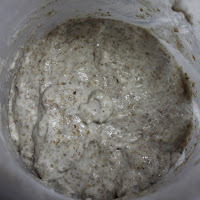 I am splitting my sourdough basics posts into three - making the starter, maintaining the starter and baking the bread. Below is how I made my starter. 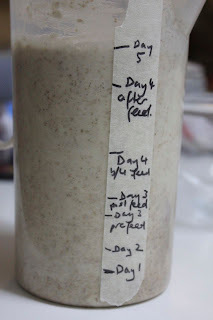 I followed Brydie's brilliant post How to Make a Sourdough Starter at City Hippy Farm Girl. In these posts, as a novice, I am including some basic information that might help me if I ever need to create a new starter. Before giving you a day by day description, I have a few notes that hopefully might answer some of the questions I had when I was starting out. A tall jug with a lid and a strip of masking tape down the side to mark daily growth. See-through is good to see the chance in texture. I think mine holds about 1 litre. 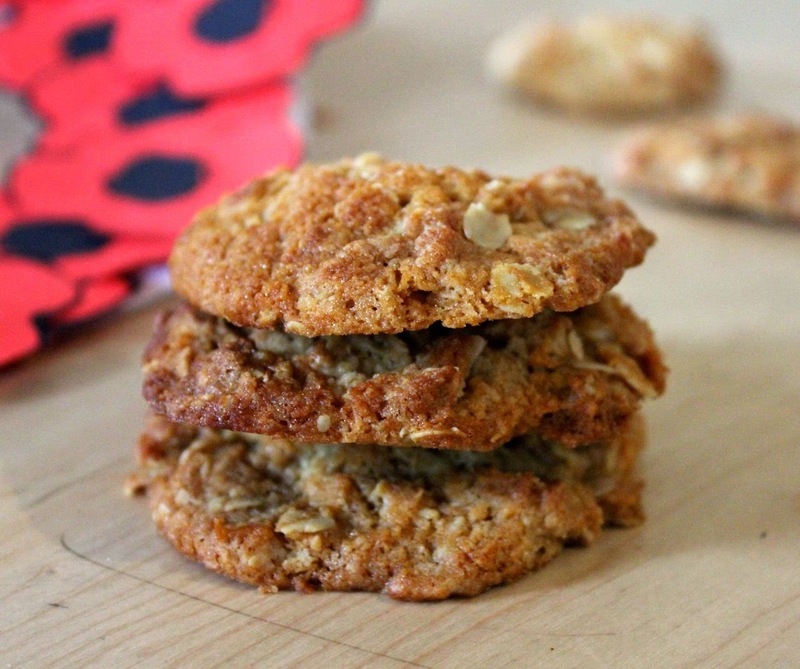 Rye flour and plain white (wheat) flour. 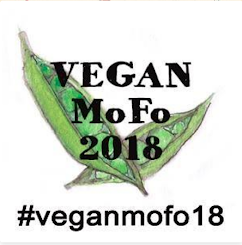 Water - preferable bottled, filtered or boiled in the kettle and cooled. I actually used tap water for most of my starter. 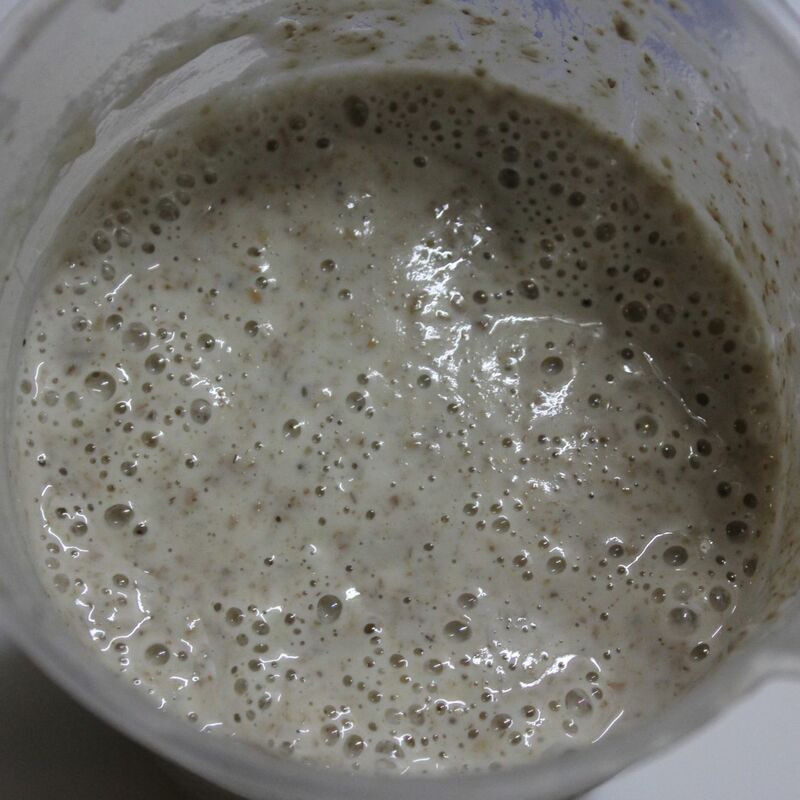 The starter is a brew of flour, water, yeast and friendly bacteria. The yeast feeds on the sugars in the flour, producing carbon dioxide which makes the bread rise and acid which gives the sour taste. The bacteria gives most of the flavour. 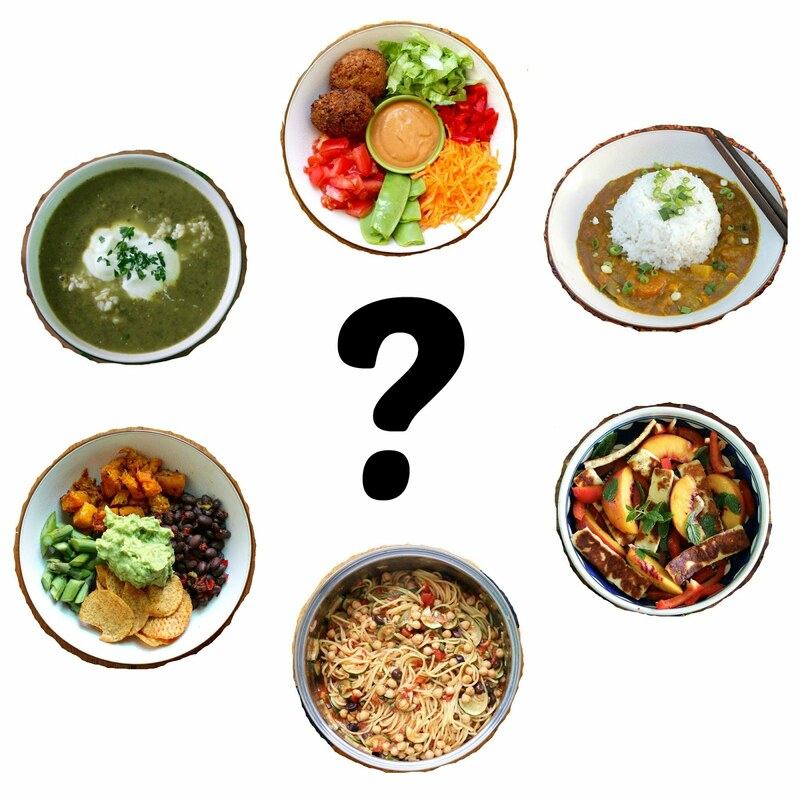 The starter should be fed at about the same time each day. Find a time when you are usually home with some spare time. I did mine at about 4pm each day. Make sure that you use clean containers and implements. 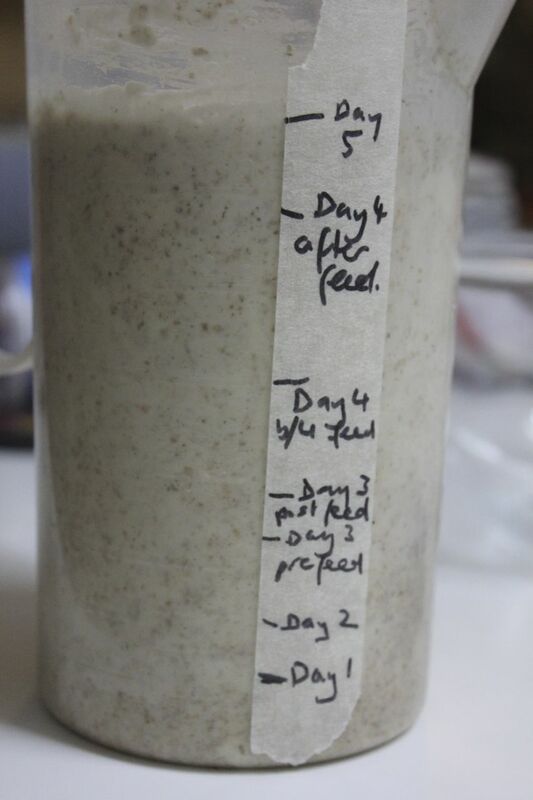 It is useful to mark off each day to get a good feel for how much the starter grows each day. Leave starter at room temperature with lid on while starting it. The lid should not be too tight because the gases need a little space to escape. A plastic lid can pop off but screw on should be left slightly loose. Rye flour is useful in starting the starter because it has additional sugars that help get the starter growing. 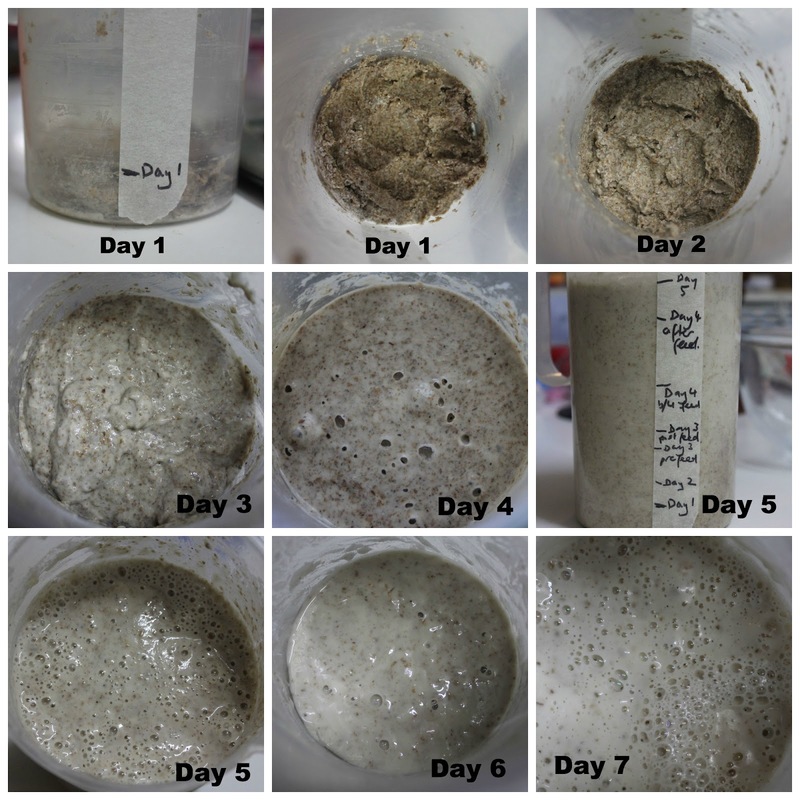 I found it really useful looking at others' photos of the development of their sourdough starter so I am sharing mine. 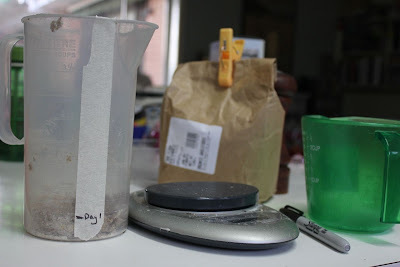 I got a bit confused about photographing and marking the level on the jug each day because it was different before and after each feed. If I ever do this again I will do an update! For now this is what I recorded on the fly. 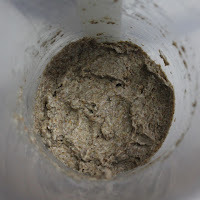 Mixed 50g rye flour and 50ml water. 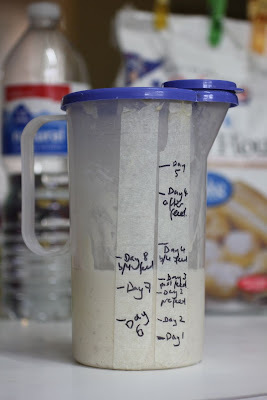 (I found it hard to measure small amounts in a measuring container and used tablespoons and teaspoons but since then I have been finding it even easier to weight water as well as flour so I would probably use 50ml water if doing again.) My starter was very stodgy and weighed 90g. 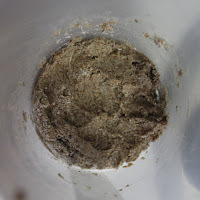 Mixed in 50g rye flour and 50ml water. It looked much drier than Brydie's photos. It weighed 200g. Mixed in 100g white wheat flour and 100ml water. Mine was still looking too dry so I added a spoonful or two of water to loosen it up. This made it easier to stir. 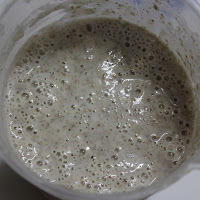 The photo was taken after I refreshed or fed the starter (ie added flour and dough). It was starting to smell a bit fruity, had risen quite a bit and was quite stringy to stir. It weighed 435g. Mixed in 200g white flour and 200ml water. I finally remembered to photograph before feeding the starter. It was starting to look bubbly and smelled quite strong and fruity. In fact I found the smell overwhelming. (I found it hard to judge as I had never smelled a sourdough starter before.) E said I had made things that smelled far worse! By now the gluten strings were really developing and it was too hard to stir with a spoon because it had grown so much (a spatula would have been better). It weighed 800g. Take out as much starter as you need to reduce it to 100g. Mix in 50g white flour and 50 ml water. (The post-feed level is actually marked as Day 6 on the jug in the last photo I think.) As for the amount you toss off, I used some of mine for pizza dough but it didn't have much of a rise to it. As Susan says, it is Mine now weighed 194g. The starter had lost some of its bubbliness after the toss off the previous day. Nor did it rise much. Fed the starter add 100g white flour, 100ml water. (Marked Day 7 on the jug in the bottom photo.) Smelled less strong but still fruity. Weighed 412g. The starter had risen quite a bit and was rather bubbly. (See level marked Day 8 on jug in bottom photo.) According to Brydie by now it was likely to be a mature starter ready to use. Other people have said it might take up to 2 weeks to get your starter going. I thought the bubbles were looking good it was time to think about maintenance and bake a loaf of bread. I had focused so much on making the starter that I hadn't given much thought to maintenance. I will write more about this soon and about the loaves I have been baking. It still feels very mysterious and magical and I am not at all sure I am doing it right but I am enjoying baking my own sourdough. That's all the matters in the end! I love your guide. I love the notes section, I always love reading details about what I gonna do, with knowledge you make less mistakes. I've made artisan bread before and it tasted so wonderful. You're inspiring me to start a batch of sourdough now. :) Can't wait to get my hands on these. 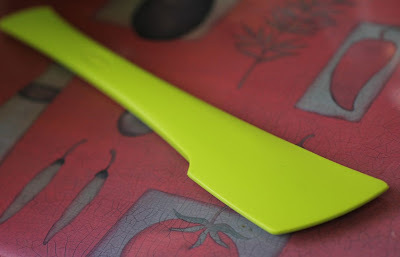 Yay - now you can make your own sour dough. 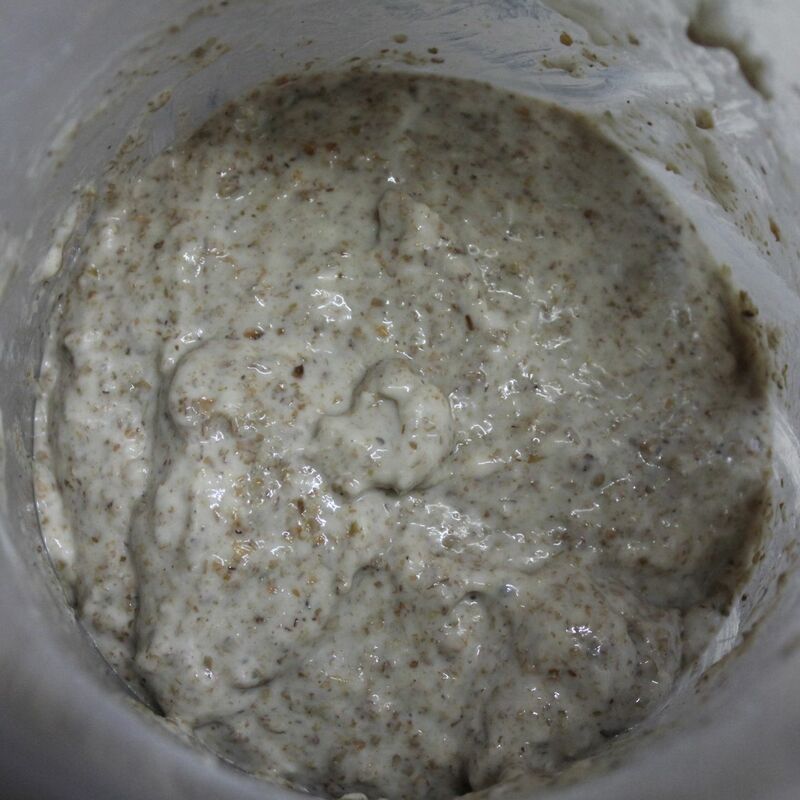 I have made a sour dough starter before for Daring Bakers, but when the challenge was over, my inclination to feed it was also over, and it ended up looking so gross in the bottom of my fridge that it got tossed. I'm still in the stage you used to be - thinking about it but not actually doing it! I don't seem to have sufficient motivation given I'm not a big bread eater and Mr Bite is unlikely to give up his traditional / normal Baker's Delight wholemeal. One day I will do it just for the satisfaction though! I'm glad you're pleased with your results and were able to make the leap yourself. 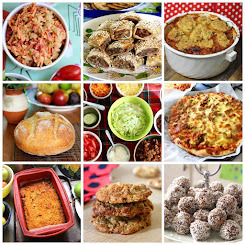 Excellent post Johanna, so clear and great photos to illustrate. 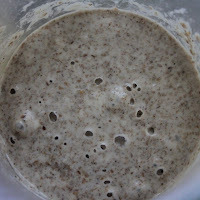 My first efforts at making a starter were dismal - it took me ages. Interesting. I made some sourdough starter once and didn't maintain it - I keep promising myself I'll give it another try. 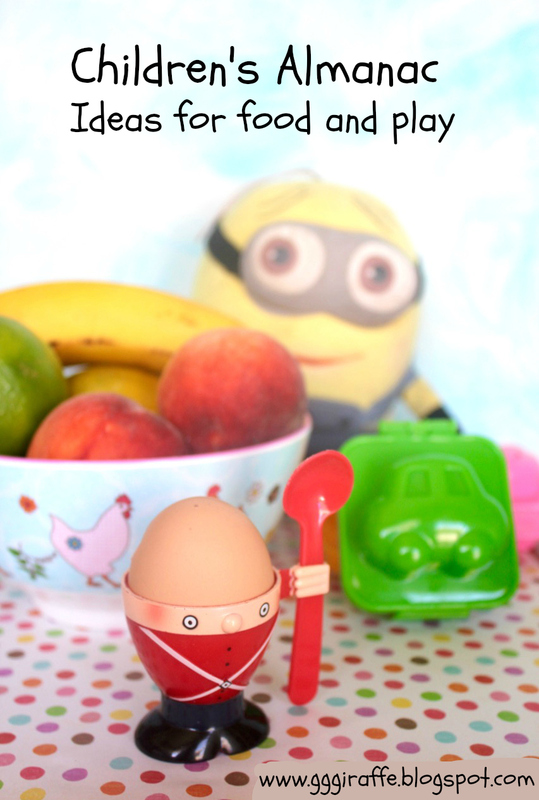 This is such an inspiring post and I'm looking forward to the rest of the series! 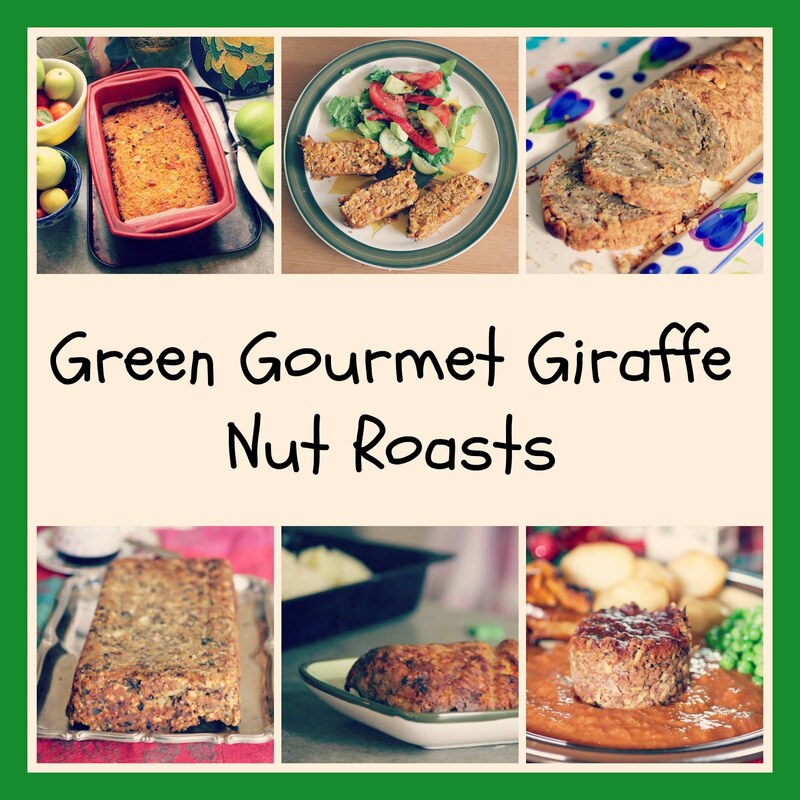 Your photos and notes are very helpful and I love that you have named your starter. 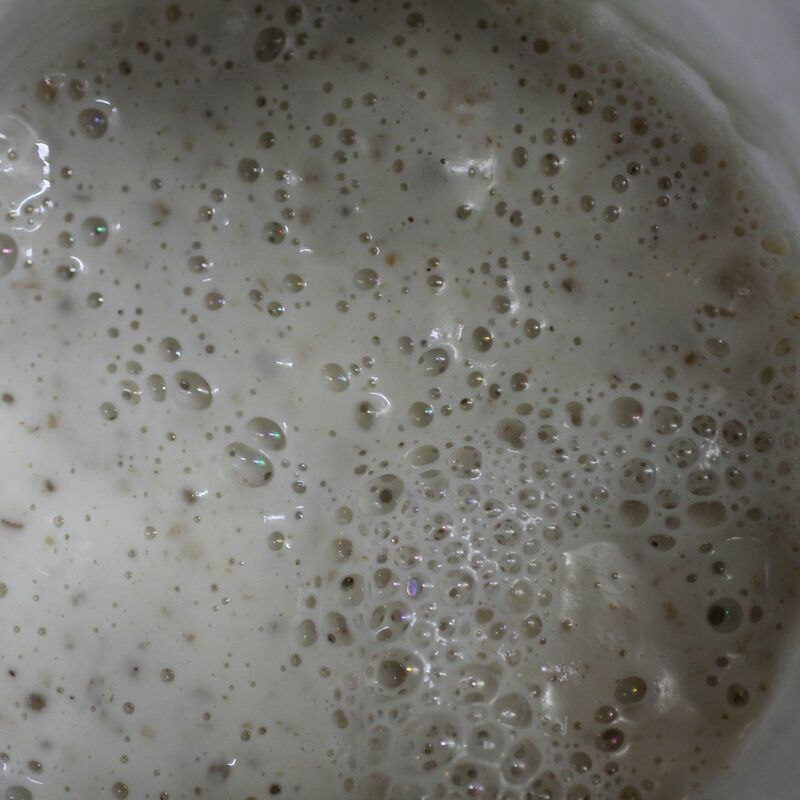 I've never looked into making sourdough in much detail before even though it has been in my mind to try someday - your series is going straight into my bookmarks.